using System.Security.Principal; // Required for the TokenImpersonationLevel enumeration. static private Uri pwaUri;          // URI of Project Web App. static private string pwaUrl;       // URL of Project Web App. // Create a binding for HTTP. There are times when you want to represnt a set of similiar kind of tasks in different color format for Graphical Reporting to Management, then cames into scene our very popular Gantt Chart. There are projects where-in there are repeated set of tasks under different Groups; like in Agile Projects having Sprints – each of which list same set of activities under different Sprints. Other example can be an Infrastructure Projects of different sites or a Telecom project tracking different locations for same set of activities. 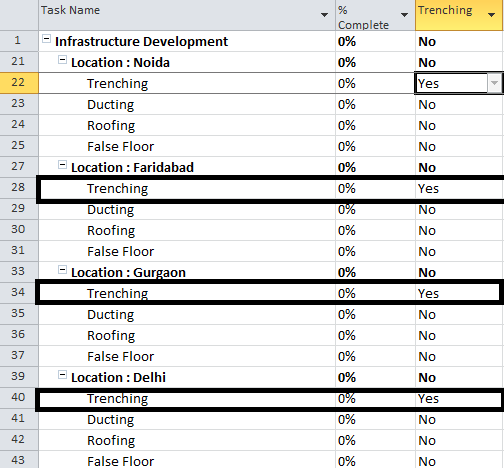 Requirement 1) I have 4 sites to track, so I want to represent all Trenching tasks in same color; all Ducting in same and so on for each site. Requirement 2) I want to show all delayed tasks progress in RED ; Future Tasks which started ahead of time in BLUE. So, I created a Project Plan as below and Baseline it. 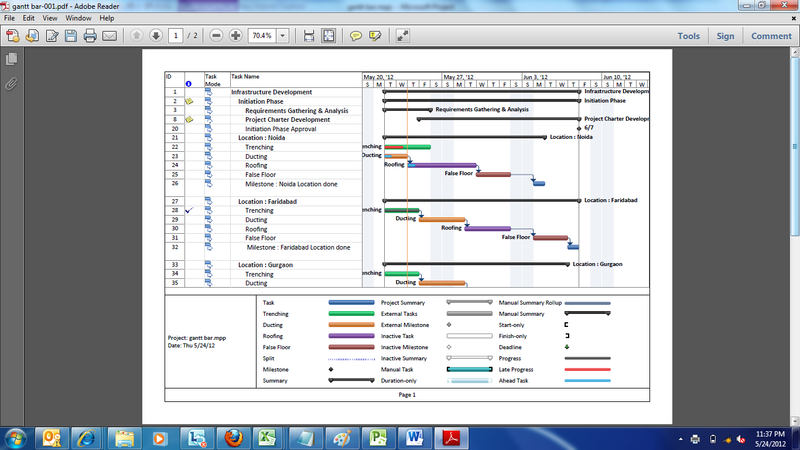 By Defualt the Gantt Chart have all Blue Bars. 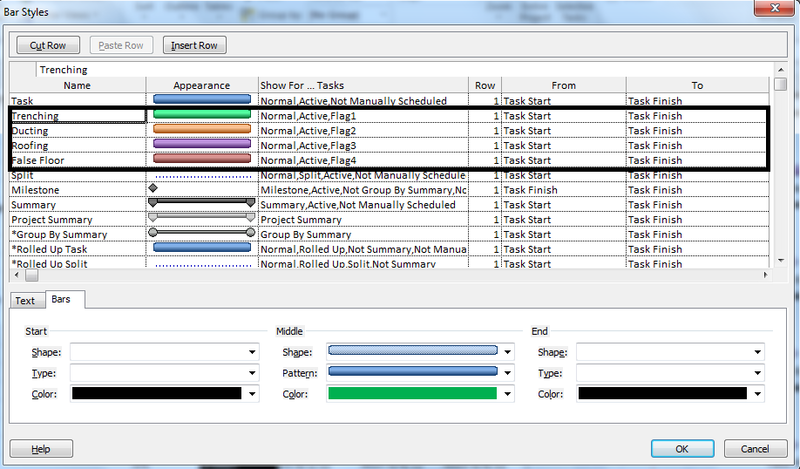 Now I want to pull colored Gantt Bars on given conditions as in Requirement 1. Apply this Filter, it will list out all 4 sites with these tasks. 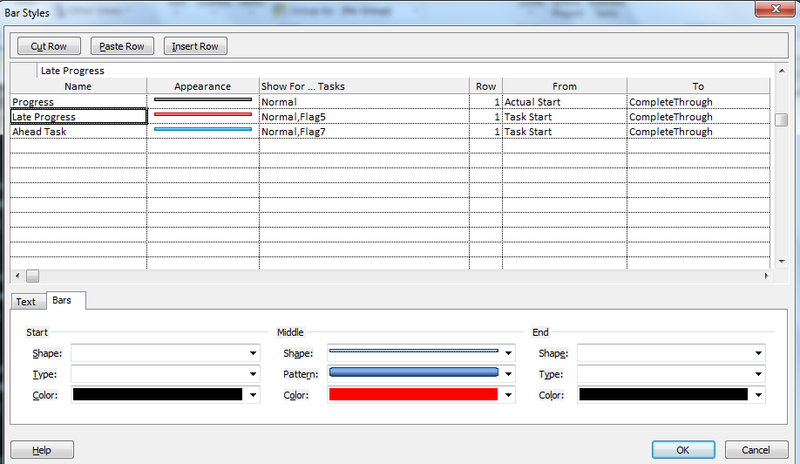 Step 2) Now to get colored bars we have to create 4 Flags for these task types, I’m showing here for 1 task rest are created in similiary. 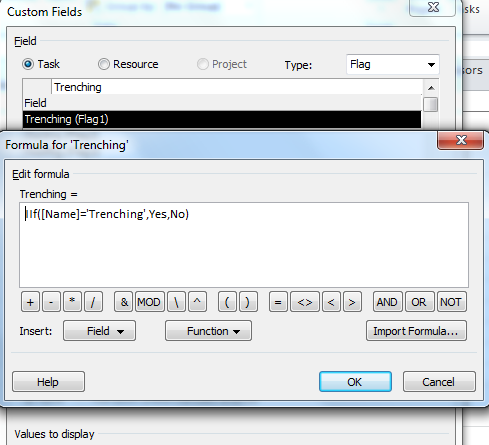 Insert Custom Field Flag 1 now customise it, rename it as “Trenching” and add a Formula to it as below. So now it will have all “Trenching Tasks” set to Yes in this Flag 1. Under Task insert 4 rows as “Trenching” , “Ducting” , ” Roofing” & “False Flooring” and add each Flag # against each task. Like I created Flag 1 for Trenching I added it to “Show for..Tasks” section, Flag 2 for Ducting, Flag 3 for Roofing and Flag 4 for False Flooring, which we created in Step 2. In the Bars tab below you can set colors as required, in the Text tab select the Name of the Task to be displayed in Left. Here color Bars is shown for Trenching. I added Task Name on Summary Bar also to represnt Site Locations, see the selection below. See how Text Tab is used to reflect Name in Right. So, your chart is all set for Reporting. 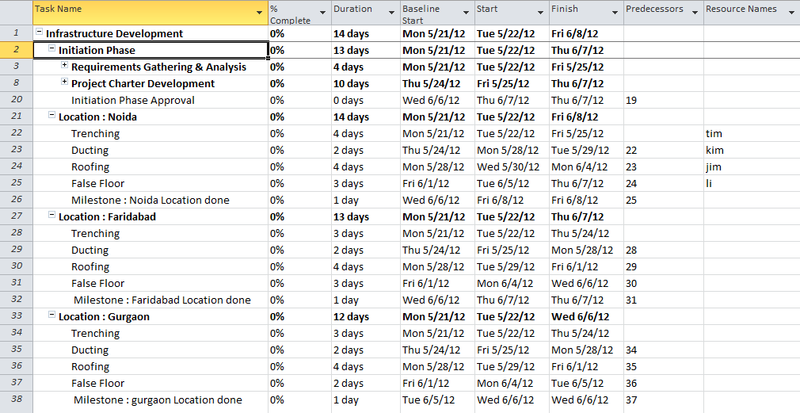 Here, I have to show Progress of tasks based on their Status. While rest of the tasks are shown as normal progress bars. Step 1) We have to again create 2 Flag fields to reprsent these 2 tasks, use Step 2 as in Requirement 1 to create Flag fields, use Flag 5 for Late Tasks and Flag 6 for Started Ahead Tasks. 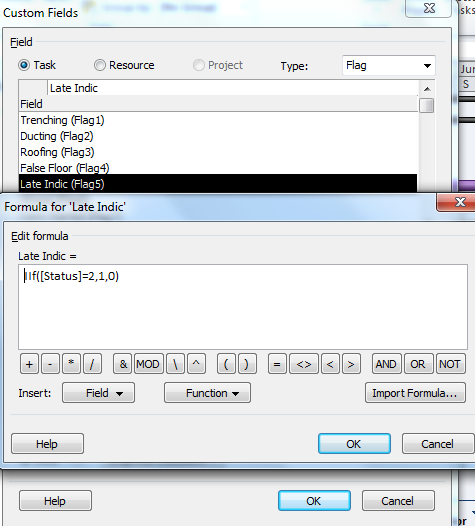 Similiary create Flag 6 as Early Started Tasks with following formula : IIf([Baseline Start]>[Start],1,0) make sure you have Baselined your Project. Step 2) Now that we have another 2 Flags to identify the Late Progress and Ahead Tasks, we want to represent them with color code. Again open Bar Styles by Right Clicking on the Gantt Chart. Scroll to the bottom of the list and insert these 2 types as shown below. I have added both the Flags as shown in figure. Now look at the progress bar on late tasks and tasks starting ahead of time. 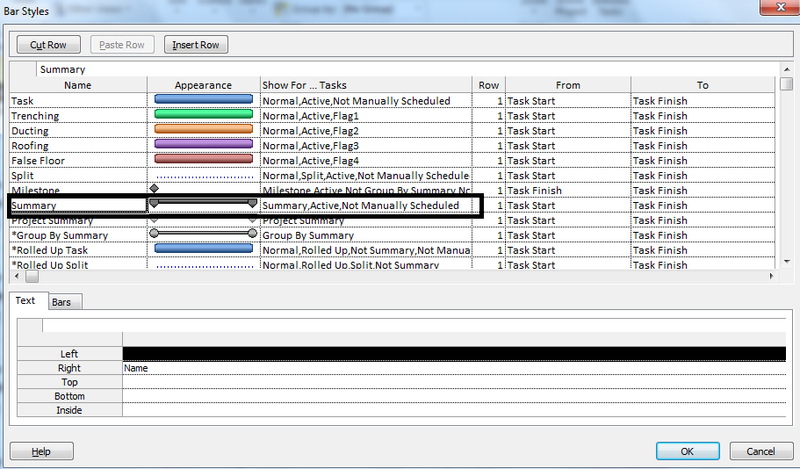 I have highlighted the tasks in table in same color in which they are appearing in progress bar in the Gantt chart to make it clear. Its visible that late tasks have RED progress and Early Taks BLUE. Now to share with Management I can print the PDF of it and share. Here comes my PDF to share across for Reporting. This is very helpful not only for Infra Projects but Agile Projects too, with some slicing and dicing done here and there to represent it as required. 'Ribbon.Read' if the Browse tab is selected. Microsoft Project doesn’t let you paste a value into a range of cells like Excel. So, instead of typing in durations, names, dates etc. or pasting one at a time, there is a “Fill Down” and “Fill Up” menu option. Select the cell that contains the value you want to copy, select the range, select Fill, and select “Fill Down” or “Fill Up.” In Fill Down case the value of first cell gets copied in range and in Fill Up value of last cell gets copied in upper cells. This can be done either by Right Clicking or going to Task Tab -> Editing -> Fill. In snapshot below I have highlighted the cells in green, that I will select as range for Fill Down Option. I want to copy duration of Task ID 4 i.e. 6 days to all tasks below. I select the range and Click on Editing -> Fill -> Fill Down, it fills in durations as 6d for all selected tasks. 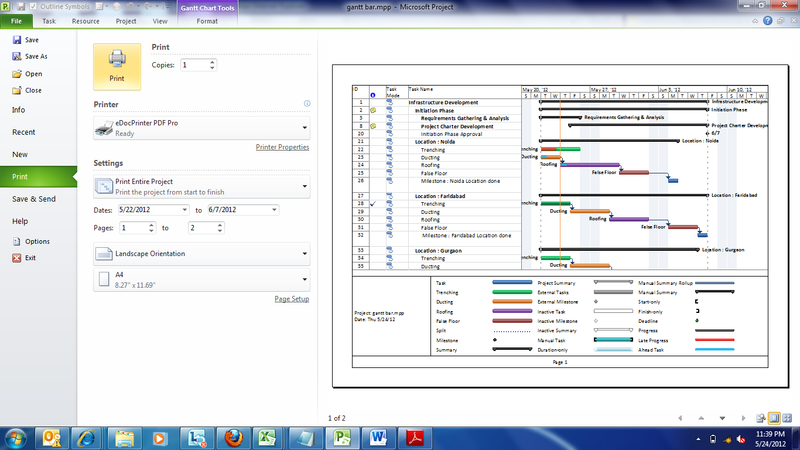 Outline Number is an excellent automated option to show a task hierarchical position in a Project Plan. This is calculated automatically with addition, deletion and move of a task. It depecits the current level of deepness a task is having with respect to total levels maintained in a Project. In the snasp-shot now I cut-paste Task ID 3 i.e. Task Name “c” to the bottom of the project, it will automatically change the level of the task. I can view different Outline Level Tasks by Clicking on View -> Outline -> and then filter on particular level. In snap-shot I’ve filtered tasks at Outline Level 2. Now if you want to see the sub-task of any task at this level, you just need to place your selection at that Summary Level and select -> Show Task. Like I selected Task “e” for “Show Task”. This will list all its sub-tasks. Similiarly “Hide Task” option works. All Sub-task can be used to expand the plan completely. 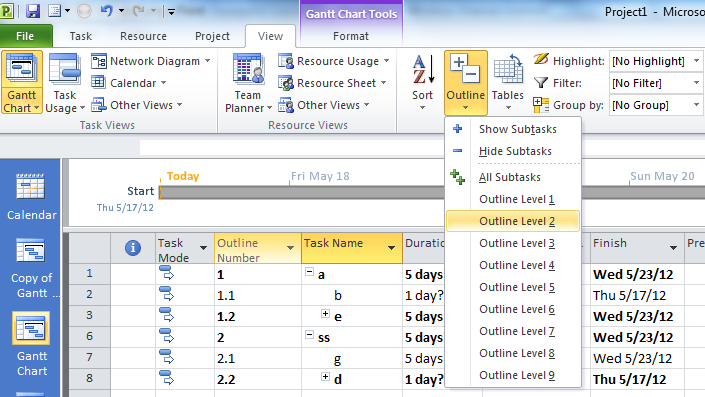 Outline Level field can be inserted in the Gantt View to see the top level of a task, say a task it at 3rd level of hi-archy it will show 3, while Outline Number would represent its relative numbering, say for the Task ID 4 i.e. “h” Outline Level is 1.2.1 -> It is sub-sub Task of Task at level 1 and at level 1. While Outline Numer shows 3 i.e. depth of hiearchy is 3 for this task. In next post I will cover Outline Codes and WBS.